Detailed planning encompasses the aspects of the optimal sequencing of operations or orders and the detailed production capacity levelling within a short-term horizon. Detailed planning overview: schedule with production orders in sequence and relevant detailed information, such as due date/requirement date, product characteristics (here: diameter), material, status, duration, quantity). 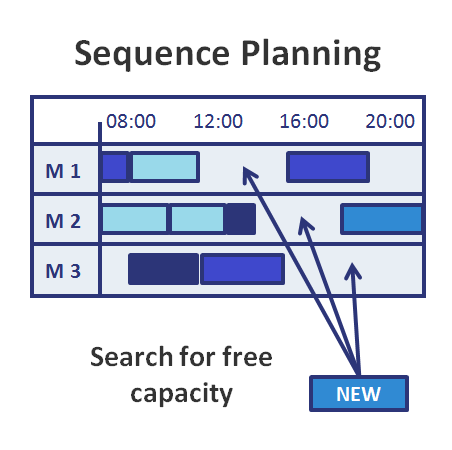 Detailed planning can be carried out completely in the background or online using the corresponding function code in the PPC Sequencer. An advantage of the PPC Sequencer is the combination of automatic and manual detailed planning. 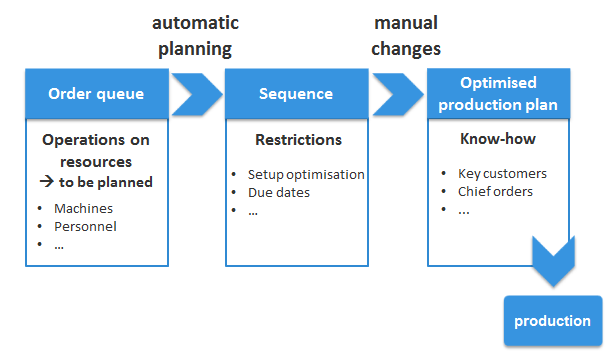 The automatic scheduling offers a proposal for the planning allocation with all its consequences (derived indicators, exceptions). Afterwards, it is possible to fine-tune the results manually.